Kurt Schaffenberger holds an odd place in my brain as far as comics artists go. The comics I read at a very young age were largely DC books from the early to mid-1970s. Mostly their big heroes. So lots of Curt Swan and Neal Adams and Jim Aparo and all those cats. Looking back, it strikes me as interesting that, except for Batman, it seemed that every time I picked up a book with a certain character in it, it was drawn by the same guy. I wasn't actually reading the credits at the early age, but every time I saw Superman, he was drawn by Swan. Every time I saw Green Arrow, he was drawn by Adams. Every time I saw the Flash, he was drawn by Irv Novick. There was, as far as I was concerned, only one way to draw Superman and that was how Swan did it. While I had a decent range of DC superhero comics back then, I did not have any of their then-recent revival of Captain Marvel. I somehow missed the Filmation cartoon and the live-action series (although I must've seen at least one episode of the latter as I do have extremely vague recollections of Les Tremayne's role in the show for some reason). Most of my familiarity with the Marvel family came from a set of ViewMaster reels and the Little Golden Book pictured at the right. Shazam: A Circus Adventure was published in 1977. It was written by Bob Ottum and drawn by Schaffenberger (misspelled "Shafenburger"). 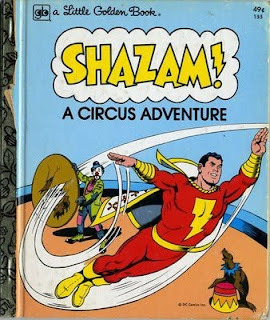 It was, as I recall, a silly story of the Marvel family stepping in to perform all the acts in a circus because the regular performers had walked out. They did a trapeze act with no trapezes and some old school lion taming, and there was a particularly embarrassing looking clown outfit for Captain Marvel himself at one point. But because of the superhero angle, it held the longest shelf-life of any of the Little Golden books I read as a child. I have another vague recollection of re-reading Super Friends a couple years later, and realizing then that it obviously wasn't Captain Marvel wearing red and blue tights, it just happened to be the same artist who worked on both stories. And by then I had seen Schaffenberger's work in a few other places. Rarely any of the big name titles, and usually characters whose "look" was defined (for me) by other artists. Today, decades later, I still don't have a very large collection of comics featuring Schaffenberger art. But I'm always quick to notice his style, probably as he was the first comic artist that I recognized beyond a single character. There always seems to be a classy simplicity about his work and, as I think about it, probably helped to pre-dispose me to the elegant brushwork of Joe Sinnott once I started reading Marvel titles. It also helped define how the Marvel family "should" be drawn, and Schaffenberger's version remains my default visual for Captain Marvel. Even when he's wearing Superman's costume.